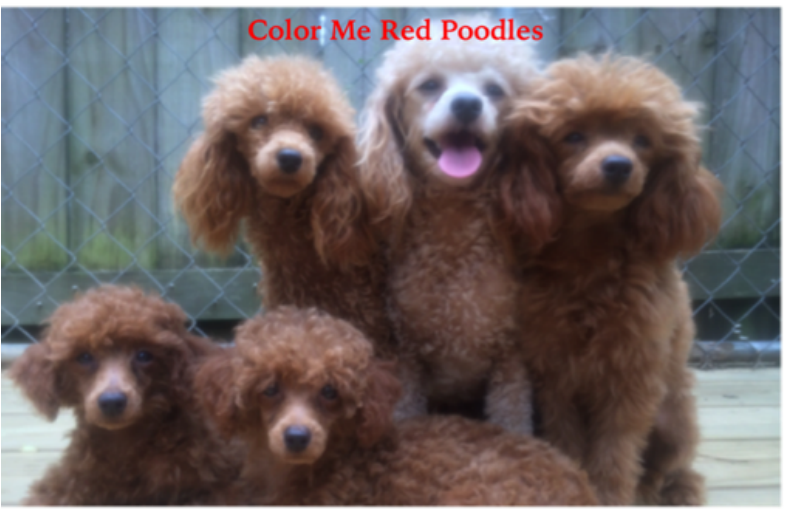 Color Me Red Poodles Breeder of quality toy poodles in Mississippi. After several years without a pet, we decided to get an apricot poodle for companionship. Very soon, we realized that one was not enough and thus purchased our first true red female. After several more additions, here we are today!!! We have been amazed at how intelligent and intuitive they are and enjoy letting them freely run in our large fenced backyard. Since I regularly work outside and in my shop, I am constantly interacting with my dogs, picking them up and loving on them numerous time a day. Nothing is better than sitting or napping on the porch with one or several dogs in my lap. My puppies are handled daily and exposed to all manner of sounds, making them well socialized, friendly and not afraid of being handled. We strive to produce a companion for you that will be healthy, happy and affectionate. My utmost desire is that you feel satisfied after your purchase and have no reason to speak ill of me, my dogs, or my business practices! !